Upcycling is very much on trend at the moment, so we thought it would be a great opportunity to show you how to turn an empty tape roll into an enchanting, dream catcher that every girl is sure to love! Ever find yourself forgetting important dates? Turn an embroidery hoop into a handy noticeboard that the whole family can benefit from. The quirky Dovecraft washi tape designs will look fab alongside your reminders! Everyone loves a free paper download and April’s collection certainly won’t disappoint. Check out our lovely selection of papers filled with textured patterns and pretty buttons. This collection will especially come in handy when the Sewing Bee is back on, so make sure to get your own set! Transform a cutlery tray into a crafty, storage masterpiece with our help. The Pretty Posy papers and DecoArt paint range are fantastic to use to give an unloved item a fresh, spruce of colour. Before you know it, you’ll have your favourite crafting products on display! Every month, design member Katie shows you how to create a fabulous layout to hold your favourite photos and memories. To work alongside our DIY theme, she took you step by step on how to upcycle an embroidery hoop into a scrapbooking keepsake that will be treasured for years to come. Finish your gift with a beautiful handmade flourish by following Maxine’s easy tips and tricks on the blog. Maxine shows you how to achieve a lovely texture on your presents with her easy, tassel technique. For a simpler look, she has also offered a few ways on how you could get crafty with a selection of colourful buttons, stamps, washi tape and more! Create a stand out, wall art piece for your home, following our monogram frame tutorial on the blog. Maxine takes you step by step on how to accomplish a vintage effect that you’ll want to use on all of your upcycling projects. Find yourself losing your smaller, crafting goodies? Hold onto your cans and jars as we show you how to upcycle them to make the prettiest, storage that you’ll be proud to have on your craft desk. Light up your nights by decorating a set of fairy lights with our free template! Choose a favourite paper pad design and adorn each light with the sweetest heart cover. This is a great way to add a simple and personal touch to your home this spring. What a range of projects on offer, which has been your favourite upcycling tutorial? Comment below and tell us your thoughts on our DIY month. 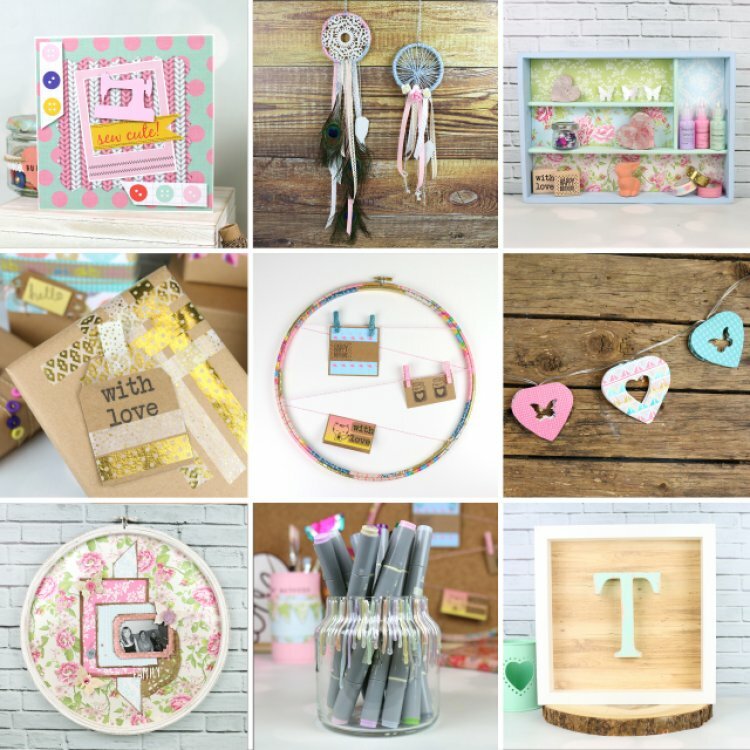 We have loved seeing your inspired makes so keep uploading them to the project gallery and #Trimcraft on social media so we can see your fab crafts!